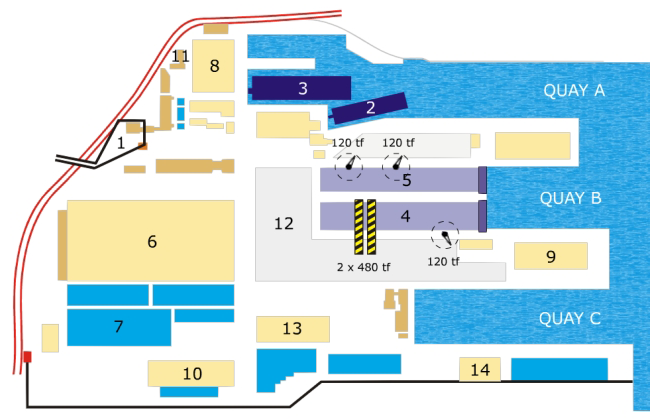 Subject to yard’s workload, either of the dry docks can be alternatively used for ship-repair or new-building activity. Still, considering the possibility to divide both dry docks by mean of intermediary gate, we can use any of them simultaneously for new-building and ship-repair activities subject to the accommodated vessel's size. 2,800 m berth for vessel's draft up to 8 m, fully equipped with all necessary shiprepairs facilities. Power supply 3x380 V; 50 Hz / 3x440 V; 60 Hz.